Now in its seventh year White Air is recognised as Europe’s biggest extreme sports festival. It is taking place between the 25 October and 2 November at Yaverland on the south east coast of the Isle of Wight. 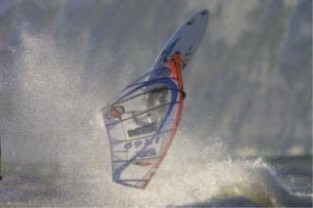 The nine-day festival comprises windsurfing and kitesurfing events as well as surfing, skating, mountain boarding and bmxing and new to the event this year – zapcat racing. White Air is probably the UK’s premier event for windsurfing and kitesurfing and should attract UK’s biggest names including John Skye, Robby Swift, Louise Emery, Ben Hanbury and Kirsty Jones. This year is expected to be the most successful yet with many opportunities to try out the various sports, as well as watching the top UK riders compete. Slalom racing: Friday 31 October – Sunday 2 November Having recently made a comeback to the competition scene in a big way, due to advanced board and equipment development allowing riders to reach higher speeds with less wind strength – this is set to be a very exciting event. Wavesailing: Wednesday 29 October – Sunday 2 November Perhaps the most exhilarating event from a spectator’s point of view, wavesailing involves jumping, looping and riding the surf. The conditions and wave heights on the island usually make for a spectacular competition with amazing tricks from some of the UK’s premier riders who are currently among the best in the world. The big event in kitesurfing will be the KRBT finals taking place from Thursday 30 October until Sunday 2 November. Riders, propelled by huge kites will perform tricks gliding up to 100m in the air. As the last major event in the UK kitesurfing calendar, most of the big names from the UK and some international riders are expected to compete. Entry to the events is open to anyone. Entry forms are available to download from the White Air website, but since the festival starts this weekend, the best way to register now is to turn up on the day. For more information on White Air as well as information on how to get there go to their website at www.whiteair.co.uk or call their hotline on 01983 409617.